Forget boring cheese and crackers. 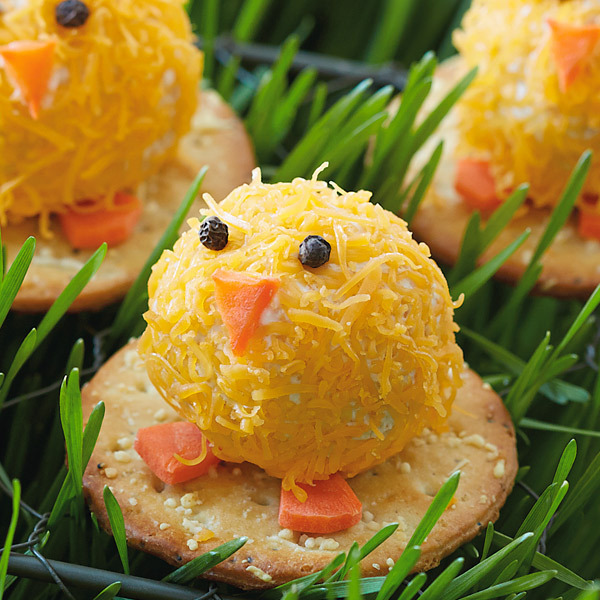 These cute cheeps and crackers make fun and easy Easter appetizers your guests will love. With shredded cheddar cheese, carrot beaks and feet and peppercorn eyes, our tasty cheese ball recipe is transformed into cute cheesy chicks. Round crackers provide the perfect perch for these bite-size mini cheese balls. Using a mixer, combine the cream cheese, Worcestershire sauce, lemon zest, and salt and pepper to taste. Refrigerate the mixture for 1 hour. Drain the can of olives. Using your fingers, cover each olive completely with about 1 tablespoon of the cream cheese mixture and form it into a ball. Refrigerate for another hour. Before serving, roll each ball of cheese into the finely shredded cheddar cheese to cover. Place each ball on a round cracker. Cut pie-shaped wedges from carrot rounds for beaks and feet and press on. Add black peppercorns for eyes.